Kibor Bot Autoclicker :: Version 2.19 Record actions with the mouse and keyboard. Generating the playback code. Version 2.19 Record actions with the mouse and keyboard. Generating the playback code. Added the ability to record and generate a code to play the work with the mouse and keyboard. To start and end the recording, press CTRL + SHIFT + X and select the appropriate item in the menu. At the end of the recording, this button becomes active, the click on which inserts the generated script into the position of the cursor. In the future this function will be improved. 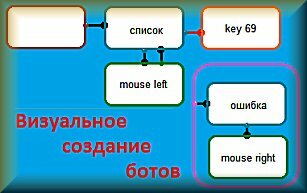 At the moment, a primitive code of mouse and keyboard keystrokes is created, indicating pauses between them. Sets a pause of 10 seconds. Unlike sleep, it is possible to shut down the script during a pause. From 500 to 1000 - it is recommended pause.